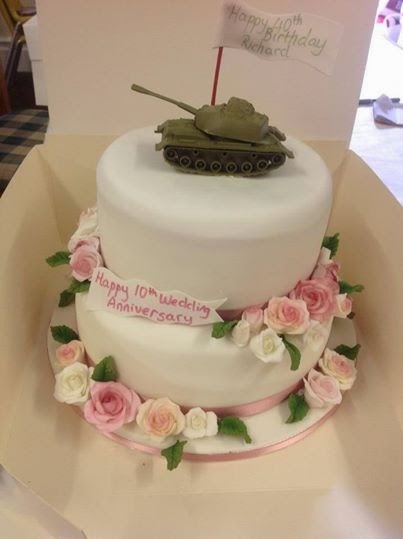 Who would put a tank on their wedding cake - or even their wedding anniversary cake? I did - for both occasions. It was certainly a talking point, but actually, there was real meaning behind the gesture. You see, when we got married ten years ago, my husband's grandparents were preparing to mark their diamond wedding anniversary. The longevity of their happy union is a real inspiration to my husband and I and we wanted to honour them in our own marriage. My husband's grandparents were married in 1944. And, like many men of his generation, he saw active service as part of the tank regiment (he was actually awarded the Military Cross). In recognition of his life as a serviceman, my grandparents had a small tank on top of their wedding cake and we used this on top of our wedding cake too. Roll on ten years and we decided to hold a party to mark a decade of marriage as well as my husband's impending 40th birthday. Every party needs a cake, so I commissioned Carole's Cup Cakes in Teignmouth to create a two tier, chocolate (my husband doesn't like fruit cake) wedding anniversary and birthday cake. Carole copied the flowers from our original cake in intricate sugar paste. She added two flags made of icing: one said Happy 10th wedding anniversary; and the other said Happy 40th Birthday Richard. And she added a tank to the top in recognition of the fact that my grandparents-in-law will be celebrating an amazing 70 years of marriage in October. Unfortunately they are both well into their 90s now and are no longer fit enough to manage the 5 hour journey to Devon so they were unable to join us for our wedding anniversary party. However, we sent my mother-in-law back to Eastbourne with photos and a slice of cake for them to enjoy. Do you have any quirky cake stories to share? That’s true!! Planning for a wedding vow renewal party is always be a fun. I recently, planned a party for a couple in Chicago. They liked my work a lot. And now, they hired me for their brother wedding ceremony.